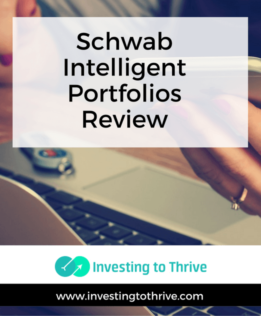 Charles Schwab has introduced online robo-advisory services, Schwab Intelligent Portfolios offered by Schwab Wealth Investment Advisory, Inc. and managed by Charles Schwab Investment Advisory, Inc. These portfolios are built, monitored, and rebalanced based on the firm's investment philosophy and enabled through its technology. For many years, Schwab has offered wealth management services, including managed portfolios and custom advice. However, the more traditional model of delivering these services at the entry level has involved packaging a diversified portfolio of mutual funds and ETFs with a minimum investment of $25,000 and asset management fee of .90%. The automated “intelligent portfolios” allow smaller investors to gain access to advisory services with no direct charges to their accounts. Learn more about these portfolios. The account minimum for a Schwab Intelligent Portfolio is $5,000. There are no advisory fees, commissions, or account service fees associated with holding a Schwab Intelligent Portfolio. Typically, robo-advisors do not charge account service fees or trading commissions (with the exception of FutureAdvisor). However, most charge an advisory fee, which is generally calculated as a percentage of assets under management (AUM) and ranges from about .15% to .50% annually; for example, a $5,000 portfolio with an AUM fee of .35% costs an investor $17.50 each year ($5,000 x 0.35%), billed either quarterly or monthly. In the areas of account minimums and fees, the absence of an AUM fee is the biggest difference between Schwab and similar robo-advisory services. This fee structure is both its selling point and an area requiring disclosure on how the firm generates revenue. To get started, I visited the intelligent portfolios page of the Schwab site, clicked on “get started” (or “log on” for those who have a Schwab account), read its basic disclosures, and responded to prompts pertaining to financial goals, risk tolerance, and time horizon. As I answered questions, a recommended personal portfolio took shape in the left side of my screen. For example, I may start with an asset allocation of 12% stocks, 58.6% fixed income, and 29.4% cash and then move to one with a mix of 77% stocks, 11% fixed income, 4.7% commodities, and 7.3% cash (note that this allocation is considered “high risk and return potential”) as I entered responses. If and when I'm ready to accept the portfolio, I'll begin the confirmation and account funding process. This process involves confirming my email address, selecting the type of account for the portfolio (e.g., individual brokerage account, traditional IRA, etc. ), and acknowledging the acceptance of the advisory agreement and disclosures. Note that I could preview the asset allocation in terms of asset classes but I couldn't see the ETFs that comprise the allocation prior to accepting the portfolio. Asset allocation is the cornerstone of the firm's approach as outlined in its whitepaper. The methodology is based on the concept of diversification, the foundation for Modern Portfolio Theory (MPT). Portfolios are customized for specific investor goals relating to return, risk aversion, inflation hedge, or income. In its literature, Schwab argues that traditional asset allocation provided appropriate diversification when returns of stocks, investment-grade bonds, and cash were not heavily correlated. That is, historically, traditional methods worked well because when one asset class underperformed in certain market conditions, another outperformed, delivering steady returns (and preventing dramatic declines) that tended to preserve principal and support consistent compound growth. However, in recent years, asset classes have been become more closely correlated. For example, Schwab proposes that U.S. small-company stocks and international large-company stocks have moved from moderate to high correlation with U.S. large-company stocks from the period of 1995-2000 to 2008-2014. Consequently, traditional asset allocation no longer achieves risk/return goals associated with diversification. In response to market changes and new realities, Schwab has refined the asset classes (also referred to as sub-asset classes) for its model portfolios. Schwab still adheres to the concept of diversification: allocate dollars to asset classes that are minimally correlated. However, the practical execution has changed: allocate dollars to 20+ baskets, such as emerging market stocks and REITs, rather than three baskets (stocks, investment-grade bonds, and cash); plus, tweak the type of equities, fixed-income investments, etc. to achieve certain goals such as growth, growth and income, income, or an inflation hedge. An interesting segmentation is that of “fundamental” holdings. Schwab has created Fundamental Index ETFs that track the Russell Fundamental Index Series. This series is based on the Russell 3000 and Global (ex-US) indexes in which securities are weighted based on “fundamental measurements of company size: Adjusted Sales, Operating Cash Flow, and Dividends plus Buybacks,” rather than market capitalization. According to Russell, this fundamental approach may increase portfolio diversification, reduce risk, and improve returns over time. Note that Schwab uses both fundamental and market-cap strategies. Schwab's Fundamental Index ETFs have expense ratios of .32% to .48%, compared to Schwab Market-Cap Index ETFs with expense ratios of .04% to .08%. Most robo-advisory portfolios that I've viewed have nominal cash holdings. One of the portfolios suggested by Schwab to me allocates 8.51% to cash, a relatively high amount. The whitepaper indicates that cash provides an inflation hedge and serves as a defensive asset. The portfolios are designed not only to deliver a diversified portfolio to investors but also to generate revenue for Schwab and its affiliates. The conflicts of interest mentioned here are addressed in disclosures. The foundation of Schwab's investment philosophy as outlined in its whitepaper resonated with me, while giving me deeper insights into the concept behind the Modern Portfolio Theory (MPT), diversification, and asset allocation. I had noticed that traditional asset classes have not seemed to be as negatively correlated as suggested by MPT proponents, so Schwab's general approach of constructing a portfolio with a greater number of asset classes with low-to-moderate correlation makes sense. Schwab also incorporates investor preferences into the portfolio design. For example, dividend paying stocks are held in income-oriented portfolios, displacing other equities. In comparison to similar robo-advisory services, the fee-free approach is attractive. But the methods of generating revenue may not be in the best interest of the investor. The high allocation of an investment portfolio to cash seems unusual. The whitepaper claims that cash is 1) an inflation hedge, which seems odd, given the low interest rate environment; and 2) a defensive asset, which may make more sense during a market decline. Most robo-advisory firms provide a detailed view of the exact components of the portfolio for the investor's approval. However, Schwab does not reveal its details until an investor agrees to purchase the portfolio. Schwab customers with at least $5,000 but less than $25,000 in investable assets who would like to try automated assistance with investing might consider exploring the Schwab Intelligent Portfolios.